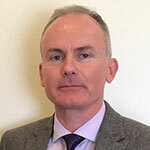 Jeremy Walsh was appointed SLP Director in January 2018, having previously worked at South West London and St George’s Mental Health NHS Trust as Head of Service Delivery for forensic, specialist and national services, and CAMHS. He is a qualified social worker and holds a Doctorate in Social Work, with a research specialism in the relationships between mental health professionals and carers, family and friends. Jeremy has led a wide range of mental health and social care services within local authorities and the NHS. As SLP Director he leads work across programmes including Forensic, CAMHS and Complex Care.